Send your own feedback to "djeimz at megaseattle dot com". if those ceramic bits heat up enough, they might generate some light. This would explain the cone; it would be useful to have it focused. about the two holes found in the rods sticking out of the ceramic bit -- geekoid friend #1 says those are most likely for a power source. Is that a swivel base it's on, James? James: It's not a swivel base, though it does unscrew. Anand: My mother's school microscope was made of lacquered brass. It's an easy metal to work and it lasts a long time. Its use came out of clock manufacturing -- the ultimate in precision for the longest time.. It could be a horn antenna. These are used to focus electromagnetic pulses. Older radar detectors had a similar configuration. This has a distinctly "home-made" appearance i.e. purpose built in the lab using easy-to-get materials. Check with Fisher Scientific for old catalogues. Linda: I thought it was one of those 60's lights. The ceramic might be a socket? But if it's a specialized piece of equipment, I have no idea. Maybe it's a hat. Max (pictured to the right): A hat? Doubtful. Anand: That was what I was thinking about! What a great idea for dealing with persistent car alarms! James: And with any luck, you'd take out your own car's ignition system as well. Of course, I've never done anything like this before. Really. And I definitely never did any property destruction or other illegal actions with it. Honest. Murray: Not that I'd know, based on the seemingly symetrical matrix-thingie, some kind of measuring device. Blank one end (control), trumpeted the other (gathering, focusing), seems to be a temperature difference indicator? I'd say it's a gauge, not a source. Have you tried hooking wires, meters up to it? James: Thanks for the suggestion. I attacked it with an ohm meter and added the results to my description. Very stylish, whatever it is. Goyra: This appears to be a microwave guide, useful for both receiving and transmitting. The wavelength of the microwaves can be deduced because it is 4 times the depth of the short piece; that causes waves to cancel out in the short piece and makes it act as a very good reflector. The wires would connect it to an electric circuit. Basically this device provides a good impedance match between signals in wires and signals passing through the air. James: The gap behind the short piece is about 0.5 cm so that would be a wavelength of 2 cm. It's an interesting thought, though the wave guides I studied in school all had a rectangular cross section. I have no clear idea why waveguides are usually made square these days. I suppose that it reduces the number of harmonic modes that can propagate. It this is a microwave guide, it is an old and crappy one. Have you actually used microwave equipment like this, or is it only an educated guess on your part? An educated guess. I have an electronic engineering degree. Brian: So is the part the the horn fits on a Gunn diode (as used in police radar)? I'd guess that it's not a magnetron (as used in microwave ovens), as a magnetron needs about 1.5kV (which would be a big safety hazard, with those exposed thumbscrews) and is usually quite large with heatsink fins on either side. Thor: Microwave guide was my first reaction too, then the age of the equipment and the strange transducer led me to wondering about ultrasonics. Tim: My guess is that it is the heating element and apparatus for holding a cathode ray tube (CRT -- aka TV tube). If this is so, it is obviously missing the tube, which has to be a vacuum. Perhaps someone broke the tube and no one bothered to replace it. I don't know how much those things cost. Brian: Usually the heating filament is sealed in the tube. I've never seen any CRT where the heating element is separate from the tube. I don't think that would work, otherwise that would have been a great way to solve the problem of a blown CRT (when the heating element burns up). You could just replace the heating element instead of the whole tube. That said, I don't think blown CRTs are very likely anymore. At least I've never seen one. Usually something else dies first. Maybe there would be shards of glass (in, say, a seal--like what happends when you drop a lightbulb), unless it broke very cleanly. Tim: Yeah I think I'm conviced that it's not a CRT. Although, I didn't mean burned out. Maybe someone dropped it and it shattered. James: There were no traces of glass that I could see. Tim: It was found in a middle school, correct? I was just wondering of the things mentioned earlier, what would make the most sense? I guess I'm always curious by little puzzles like these. James: Some kind of heat radiation experiment might make sense in that context, whereas microwaves would not. I did do a lab using 3 cm microwaves in my 2nd year of college. The horn was kind of a square cross-section megaphone with an exponential flare as I recall. Lew: I would GUESS that the "mystery object" is a microphone. I would further guess that it was "found" at Eckstein Middle School. It LOOKS like a demonstration/experiment built by Don Scott who taught physics and chemistry at Roosevelt High School and general science at Eckstein Middle School. James: It was found at Asa Mercer Middle School, maybe ten miles to the South of Eckstein. The "ceramic pack" is probably a charcoal microphone element and the rest of the assembly is probably the "sound focus" device. It was made of copper because that was the sheet material most commonly available for "sheet metal shop" back in the 60's. The JPG's show the use of sal amoniac as the "flux" -- which would also confirm a date in the 60's as "probable". James: I'm pretty sure it's brass rather than copper. Also, I don't think it was made with sheet metal stock -- the cone has no seams. I like the microphone theory though. Dave: Based on the heat pitting around the oriface, I would venture to say it might be a device for warming something in a flask. Put a Bunsen burner underneath it on low, and you get warm, not scorching, heat to come up around a suspended flask. Bunsen burners are pretty efficient, but the don't set on Low easily. Fred: At Providence Hospital , Providence Medical Tower, x-Ray section, there is a small glass case with the actual original x-Ray tubes used years ago in this area. Your item looks very much like one on display, except for the ceramic innards. James: I'd say the methods of construction (brass and hand painted base) are indicative of the era rather than the function. Andy: Any chance of a closer view of the front & back faces of "the heart of the beast" as you call it? You might be able to get a close view by just laying it flat on the glass of a scanner. James: An excellent idea! You can find my scans on the closeups page. I'd say the two brass bits are definitely electrical terminals. Malcolm: Hook up a voltmeter to the two posts, set it to the 10 volts DC range, speak into it and see if you get a reading. If not try on a lower scale. If you get nothing, try it again using a flashlight. If you get nothing at all it just might BE a waveguide. James: I get nothing at all, which might mean it's broken. I tried holding a paperclip across two of the grid elements to bridge the crack that I think is there, but I'm still not getting a signal on any scale. I suppose the next thing is to test for microwave sensitivity. I'm disinclined to hotwire my microwave oven though. 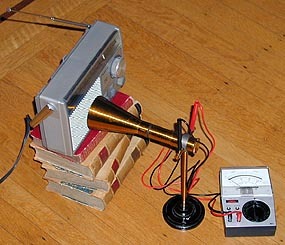 Little old Larry: My GUESS is that the device was designed for demonstration rather than pure function. Hook a power source to the terminals, and measure the heat change at either end as a function of current flow, and/or pass a cooling stream of air through it and measure the variation in current flow as a function of the subsequent change in temperature. I am assuming (possibly in error) that the grid is porous enough to pass an airstream through. James: The grid doesn't appear porous at all. You can see that in my recently added closeups. I agree that it's a demonstration device. It doesn't look durable enough for every day use. Steve: My vote is for a battery-operated wallmounted training device for baseball fielders. Failing that, it is a meat-tenderiser for use on dolphin's noses. James: Thank you kindly for your response. It's a refreshing change from all those wave guides and microphones. And good luck with your patent application. James: Another mystery object has come to light with some physical similarities to our Mystery Object. It's probably just a red herring though. Thanks to August for the picture. August: I know what it is, but until last Thursday (April 6, 2000) had never even heard of one. This one is located about a hundred miles ESE of Dallas, TX. Neil: It's a pocket megaphone for giving instructions to noisy classes. Steve: What you have is a brass demonstration Thermopile in a table stand. 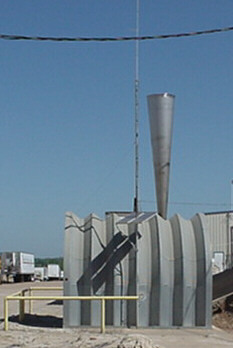 The horn is used to collect radiant heat. Inside are heat detectors. The electrical pickups connected to a gauge. James: Knowing that it's called a "thermopile" makes it easy to google up similar images. I think we have a winner! Many thanks!